"Thanks for sending two fantastic dogs, we are already planning on a couple more from you. "People have often come up and commented on how good he is, but now people are coming up and asking where I got him from !" "Tess has a great little nature and wins people over quite quickly." Adam Foster with Noonbarra Tara. Over the past 30 years, Noonbarra Kelpies have become one of the best known and most successful Kelpie Studs in Australia, despite us only breeding small numbers compared to many of the large Kelpie Studs. We have always preferred to stay a small Stud and keep everything hands-on just by our family to ensure we get the quality we want. 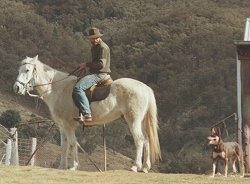 Our family has been associated with breeding and training Australian Kelpies for over 90 years. We are 3rd generation family of breeders & trainers. We are authors of five books on dogs. Stephen also works as a professional dog trainer and behaviourist on all breeds. We still breed on the best of the old Kelpie bloodlines and all our dogs go strongly back to the renowned Kalari Kelpies and are direct descendents of the great Kelpies of the 1800's such as Quinn's Coil, Tully's Moss and Gleeson's Kelpie. 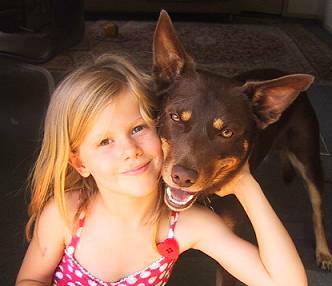 Our Kelpies have also increasingly been sold as wonderful companions to families in cities and suburbs where they have excelled as faithful, loving ... and often a little spoiled, pets. "She is a wonderful dog. I cannot begin to tell you how happy I am with her. You guys did a great job of picking the perfect dog for me. - Noonbarra Ruthless U.S.A.
"If someone offered me a million dollars for her she wouldn't be for sale, I love her very much and I'm pretty sure the way she looks at me that the feeling is mutual." - Noonbarra Tally, Victoria Australia. "My life has been so enriched and I am so blessed for such a special companion. " When I picked him up from your place, you predicted (Mary) that I would have a “very handsome dog”. Well, he certainly is that. When I take him for walks, people quite often stop to tell me what a good looking dog I have got. – In the evenings, when the work is done, and I am watching TV, he usually lies down on his mat next to my chair, but sometimes he comes closer and rests his head on my feet. That’s how I know he loves me, even if he is distracted by other dogs. - Rolf Regal with Noonbarra Jaffa. Just a quick update on (Noonbarra) Astro. He is doing amazingly!!! We are so happy with him and just amazed at how well he has settled in and how quickly he is picking up things. The create training is a god-send, he loves his create. When he wants time out during the day he climbs in to have a sleep in the sun and at night he is more then happy to climb in for bed time, we don’t hear from him till morning when we stir. Kelpies we have for sale now ! We have bred dozens of Kelpies who have been Sheepdog Trial winners in Arena (paddock - 3 sheep), Utility, Farm and Yard Dog Sheepdog Trials including the National Australian Open Champion, multi-western Champions and the NSW State Open Champion. We have bred and trained thousands of dogs, as well as teaching others through our training school and private lessons. We have also been involved in TV and film work with our Kelpies and given numerous exhibitions around Australia. (see section). 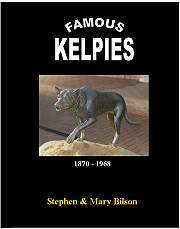 We have written books, magazine and newspaper articles on the Kelpie breed as well as producing a series of Videos & DVD's. We have served as directors of the Working Kelpie Council of Australia and the International Working Kelpie Club. Our Noonbarra Kelpies are so highly thought of that they are often purchased as foundation stock for dozens of other Kelpie Stud breeders who need top bloodlines. We are quite proud of that support from other breeders. Our Kelpies are the old style dogs. Most are small - medium types with an athletic look and a good turn of speed when it is needed. All our Noonbarra Kelpies have been bred very strongly back on a direct line to the great station and trial working Kelpie bloodlines of Kalari. Kelpies from these lines include the famous Liscannor Pace, Rockybar Buff, Chondo Doll, Liscannor Kay, Le Cliff Jock and Kalari Joker. But the main influence for Noonbarra has always been the great Kalari Basil born in 1959. We have more of his blood in our dogs today than any other Stud in the country and we are very proud of this achievement. His work, temperament, calmness, versatility and incredible thinking ability has always been the benchmark we have bred towards at the Noonbarra Stud. We are purposely still endeavouring to breed more towards the old style of Kelpie which has a lot of holding ability, distance and break out and allows the stock to settle. 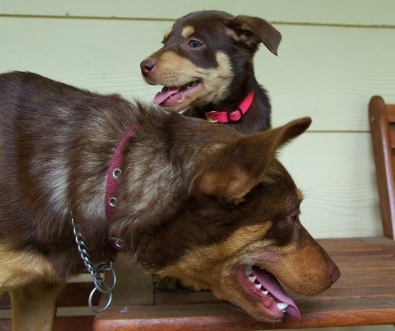 These are medium and smaller sized Kelpies that show eye and style and are calmer dogs on stock. They are also intelligent, loyal dogs. We are very proud to say that our Noonbarra Kelpies have maintained many natural inherited traits that are becoming extremely difficult to find in a lot of the modern bloodlines today. We prefer to have Kelpies with a kind and loving personality, who are good with children and show a high degree of intelligence, good agility, respond well to training, know how to settle and enjoy being with their owners. 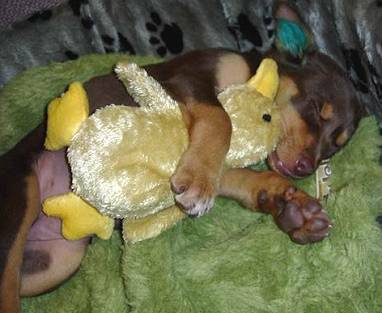 We think this is what is needed in a top Kelpie today. 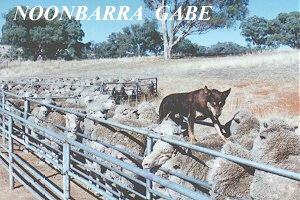 Our Noonbarra Kelpies are bred to be loyal and friendly and that is why so many stockmen buy them as their work mate. 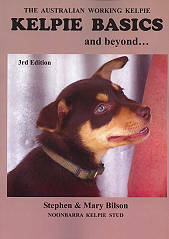 It is also likely to be one of the main factors in our growing sales to families who want a genuine Working Kelpie as their choice for a companion dog! 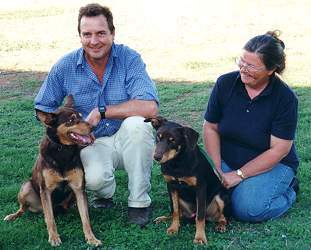 Stephen & Mary (2002) with top sire: Noonbarra Dusty III and a big puppy: Noonbarra Jack V.
SEE REFERRALS AND CUSTOMER REVIEWS OF KELPIES WE HAVE SOLD!